Being someone who owns fewer than fifty PC games and barely knows how to modify hardware or even code in BASIC, I owe the opportunity to write this article largely to our president Joseph, with whom I connected with through Humming Bird Soft’s adventure games. I absolutely adore games and want to make sure that they are lovingly preserved for posterity. 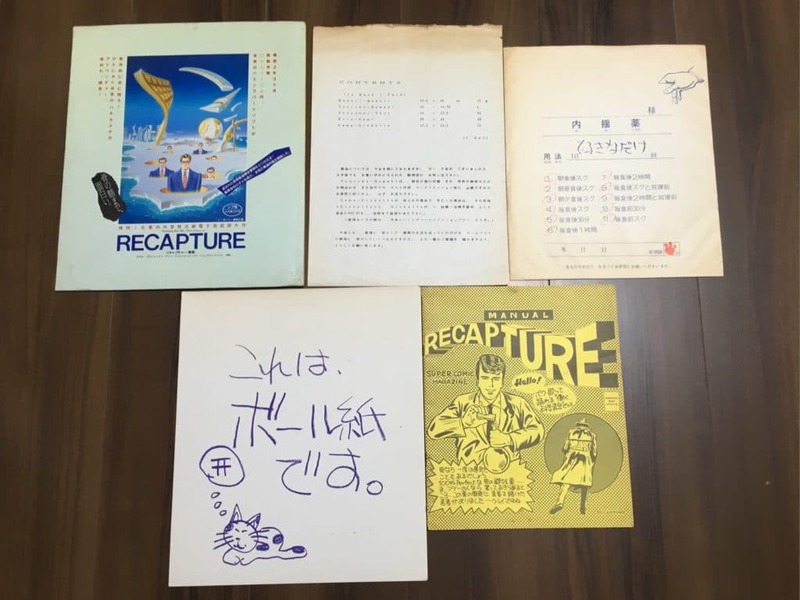 On that note, I would like to present this article in commemoration of the Game Preservation Society’s successful preservation of Recapture, a game released by Humming Bird Soft for the FM-7 series systems. At the mention of Humming Bird Soft, some readers might remember games like Record of Lodoss War or something older like Laplace’s Demon. They are absolutely right, but in addition to that, Humming Bird Soft was also the first company in Japan to produce adventure games with a certain level of quality. The first of these was a 5-inch disk for the FM-8, titled The Palms (priced at 11,000 yen at the time). 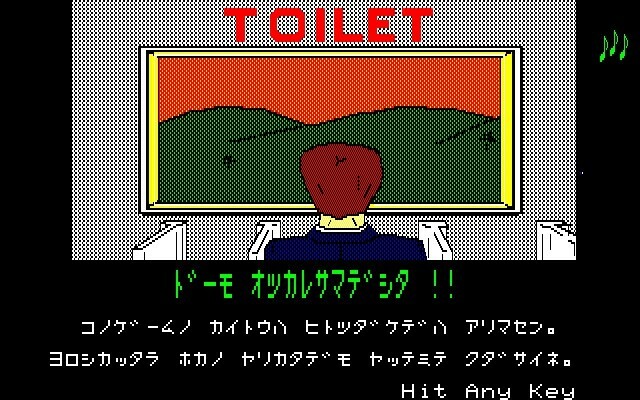 Before The Palms, adventure games mainly took place in locked-room scenarios, like in Mystery House by Microcabin (a Japanese clone of the famous Mystery House by Sierra Online). 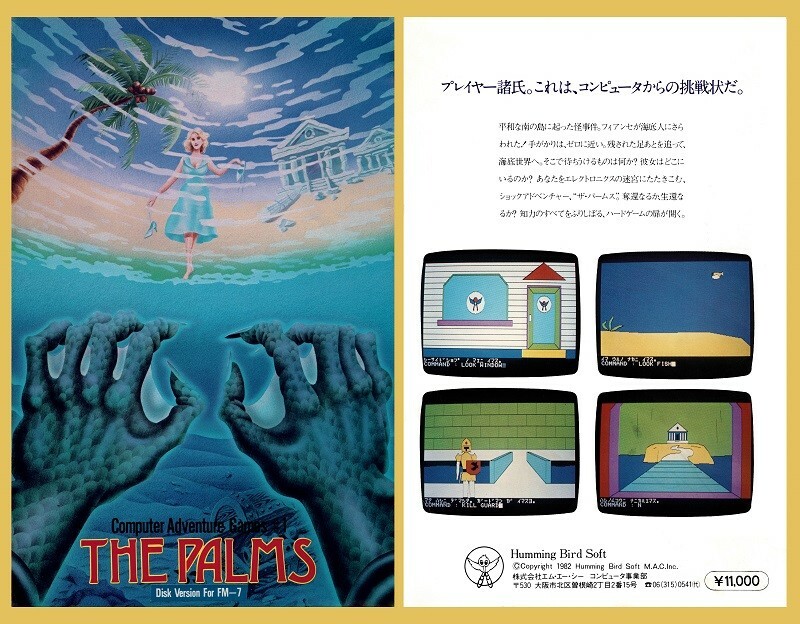 The Palms gave the genre a different take by presenting a game world that expanded outwards, from the neighborhood reminiscent of the Shonan Beaches, to the ocean, to Smoopa, the underwater city. 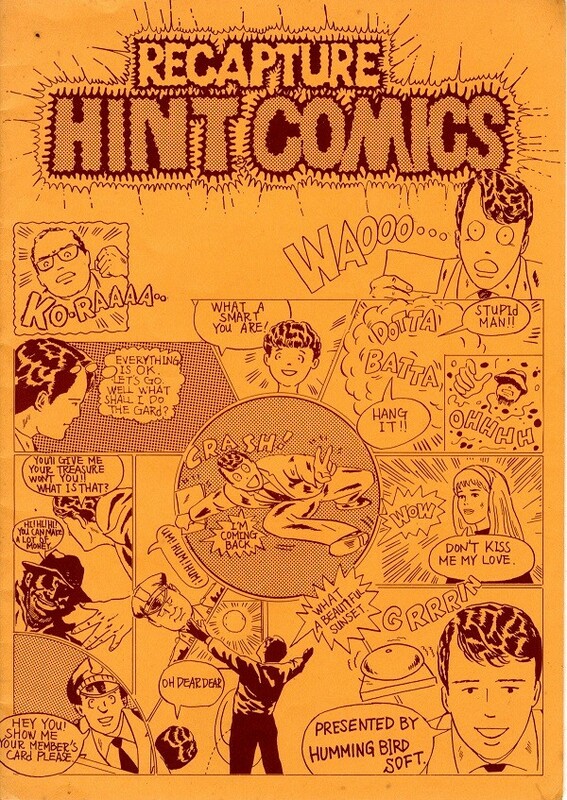 In addition, it was in color, which was groundbreaking at the time. Sales commenced during January of 1983, when the market for PC games was still young, and The Palms raised the bar high for domestically produced games. 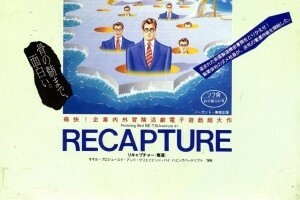 Recapture was released in 1984 as the first title of the Humming Bird – Another Venture #1 series (9,800 yen, reduced to 5,800 yen in 1985). True to the spirit of being “Another Venture,” it went in a different direction from the fantasy settings of previous Humming Bird Soft games. The protagonist, a researcher at Fly Pharmaceuticals, is a young man who is putting all he has into a “100% Perfect Male Contraceptive” (according to the manual). He succeeds and creates the male contraceptive “Kondoh-Muyo” (literally “condomless”). However, rival company Mosquito Pharmaceuticals will not take this lying down and steals the research files from our protagonist while he is out drunk while celebrating. What is our protagonist to do? The press conference is today at 4:30 p.m., and if he does not return by then, it will spell the end of Fly Pharmaceuticals. Thus the story begins where you as the protagonist have to RECAPTURE the missing files. This prologue is included in the manual in comic-book style; give it a read if you get a chance! 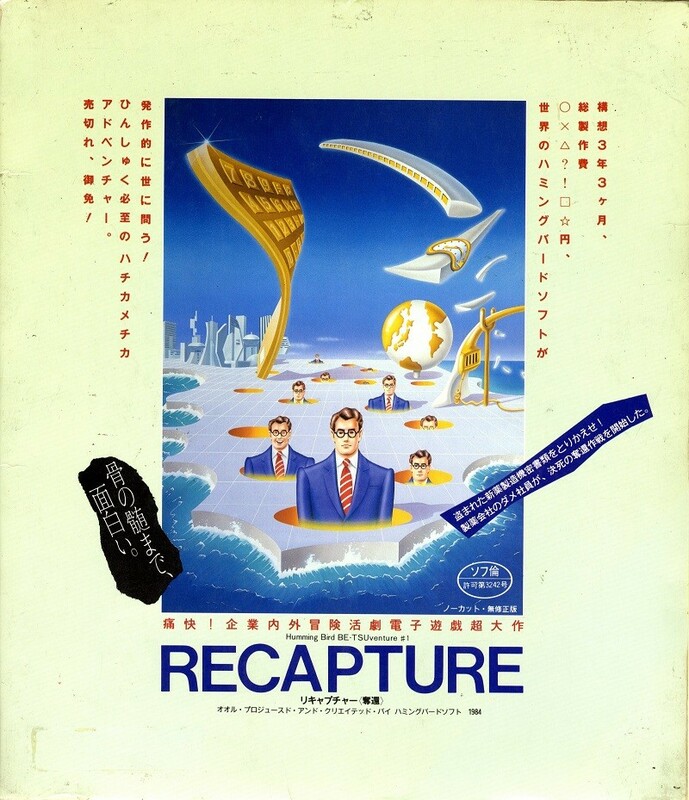 For PC games in 1984, it was standard practice to have a slightly well-designed box and a simple manual, but for Recapture, there was an elaborate set with a Dali-esque package, a comic-styled manual, a case resembling a medicine package, and a piece of cardboard with “This is cardboard” written on it. Perhaps they were emulating Infocom, which had various accessories included with the text adventure games they published for Apple and others. Hudson Soft even included soil in their package for Dark Focus: The Case of the Bunnygirl Murder (1986). To avoid spoiling the game by revealing too many details, I’ll just introduce each area briefly with a few screenshots. This is Fly Pharmaceuticals, where the player works. It’s fun to proceed through the game, as it’s not weighed down by too much text. Your first destinations are the accounting department and the lab. Commands like F***, BAKA (idiot) and AHO (fool) which aren’t normally functional in such games will show you a game over screen with a special scene. It’s well-worth trying out! If you take the employee bus, you’ll get to Ohatsu station. Once you get off, you’ll encounter a street hawker trying to get you to visit a “pink salon” (brothel). While Humming Bird Soft had been producing tasteful games up until that point, one of the distinctive features of Recapture is that it doesn’t shy away from lewdness throughout the game. This street also has a drugstore and department store. If you’re not skilled at finding a great bargain, you might have a hard time ahead. Taking a train from Ohatsu station enables you to get to Tokube station. What do you know! There’s a Humming Bird shop on the street staffed by a single employee. This game has a rich selection of functional commands, if you key in “LOOK HUMMINGBIRD” in front of the discount shop, you will get some information about the second game in the Another Venture series. There’s a lot available for sale on this street, and you can get some stuff through conversing with NPCs. It’s starting to feel more like an adventure game! This is the second floor of Mosquito Pharmaceuticals. The two main goals of this area are to get a staff ID card and to RECAPTURE your missing files. The first goal of getting the staff ID requires some puzzle solving. Your actions regarding something passing across the meeting room is the key. The third floor and the stairwell comprise the later half of Mosquito Pharmaceuticals. It’s time to use the items you bought outside Tokube Station! Beware, as the file in the lab is fake, but without it, you won’t be able to get the real one (which is called the HONTO-FILE, or “real file”). After you’ve RECAPTURED your file, it’s not the end yet. You’ll still need to deliver it to your manager at Fly Pharmaceuticals. However, Humming Bird adventure games aren’t so easy! If you take the wrong mode of transportation, it’s Game Over. The street hawker from before (remember him?) is also back to block your way. This is your last test of wits; have a look at the items you have and solve the puzzle! On the other hand, after being stuck forever on a particular scene, finding the right keyword and watching the scenes and story unfold smoothly from there is like a drug. You can’t get this from multiple-choice text adventures. It’s a lost genre. In addition to Recapture, our Society aims to preserve all existing games, including those that have been lost to history. I hope that anyone who can will lend a hand. Posted in Articles, Posts, Preservation.